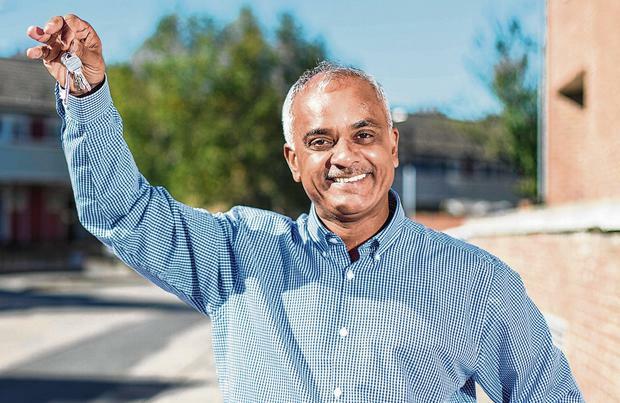 It came as a shock to self-employed driving school operator Jay Sukhdeo when he was turned down by the banks for a mortgage. He only needed to borrow €100,000 to buy a new €480,000 home. This was because the South African had built up healthy savings in the 18 years he has been living here. But the banks said no. Luckily for him his local credit union, Heritage in south Dublin, came to the rescue. He is the first credit union member in the country to be granted a mortgage under a new standardised offering being rolled out across the State by the Irish League of Credit Unions. The new mortgage has been developed with approval from the Central Bank. The product has been two years in the making and is set to shake up the mortgage market. Mr Sukhdeo and his wife Ashmin have three children - Ashmika (26), Anamika (24) and Aaryan (14). He moved to Ireland 18 years ago and the family have been renting until now. He was taken aback to be refused a mortgage from the banks. "I had been trying with the banks," he said. "I was never in the red. I had a lot of savings but it was no help whatsoever. "I was told that being self-employed meant I did not meet the criteria." He appealed to Heritage, where he has been a member for 10 years. It is based in Templeogue, Rathfarnham and Walkinstown and has 37,000 members. His application was rejected initially, but the lender worked with him and was prepared to accept the rental payments of €500 a month from his live-at-home daughter as part of his income assessment. The Sukhdeo family is due to move into a new house soon, and the mortgage payments are set to be half of the monthly rental payments of €1,600. "Hopefully many others will now get a mortgage from a credit unions like me," he said. The credit union mortgage comes as speculation mounts that An Post could link up with Spanish banking giant Bankinter to offer mortgages. Bankinter has just bought Leitrim-based credit card provider AvanCard. The card provider already has an agreement with An Post to offer credit cards and loans from early next year. An Post is seeking a banking partner in a bid to offer mortgages that undercut competitors by 1pc, which would save homeowners with a €250,000 mortgage, paying a 4.3pc variable rate, €250 a month. And a third lender is planning to enter the market by the end of this year. Finance Ireland, headed by former Permanent TSB executive Billy Kane, expects to launch mortgages and distribute them through brokers. It will offer the loans to first-time buyers, movers and switchers. However, it is not expected to undercut the existing banks but offer rates at the mid-point between the highest and lowest on offer in the market. Now the credit unions have successfully completed a pilot study of their new home loan, hundreds of people could be borrowing from them by this time next year. The new CUhome mortgage has been standardised with the tacit approval from the Central Bank, the Irish Independent has learned. Some 160 are expected to be issued by next April, with the number doubling each year. Around 100 credit unions already offer some mortgages on an ad hoc basis, but a recent probe by the Central Bank found a litany of failings in how they offer them. In response, the Irish League of Credit Unions set up a new centralised unit to provide a high standard product with the aim of overcoming the shortcomings. Global financial services firm Link ASI has been engaged to provide underwriting, legal services, software and credit assessments to bolster the mortgage offering from the local lenders. But the final decisions on home-loan applications will be made by the credit union. Arrears will be handled by Link ASI, and the league members have signed up to the Central Bank's Code of Conduct on Mortgage Arrears. Asked if credit unions were outsourcing the thorny problem of dealing with mortgage arrears, chief executive of the Irish League of Credit Unions Ed Farrell said: "If and when a credit union gets there, it has to be done right but it will be done in consultation with the credit union." The average interest rate on the mortgages will be a variable 4pc, which is considered high compared with some of the rates in the market. Project manager for the league's mortgage Ciaran Mahon defended the rate, saying it compared favourably with the variables offered by Bank of Ireland and Permanent TSB. "We are not expensive compared with Bank of Ireland and Permanent TSB," he said. "We are pricey compared with AIB's 3.2pc variable, that is true, but we are not setting out to be the cheapest." Credit unions are reporting huge pent-up demand for mortgages. Current rules mean credit unions can only issue 10pc of their individual loan books in long-term lending, such as mortgages. Mr Mahon said even with the lending limit, credit unions have around €270m to lend. This could mean around 2,700 smaller mortgages. The Central Bank is due to begin a consultation process on lifting the lending cap, which could be finalised by next year. Nine credit unions are already offering the new mortgage product, including those in Westport, Birr, Mullingar, Douglas and the St Paul's Garda, and the St Joseph's Irish Airports credit unions. Five more lenders have signed up, and it is hoped 60 credit unions will offer the loans in the next year or two.